Sacroiliac pain syndromes are rare, but can have catastrophic consequences for patients, who are often disabled by severe symptoms. The sacroiliac joint used to be a more common location used to explain lower back and hip pain. However, research science has disproven many antiquated theories of pain that were formerly linked to joint degeneration and firmly established the ways in which the SI joint can actually generate symptomatic expressions. The sacroiliac is an extremely important joint and when a real structural problem exists, the effects can be terrible on overall physical functionality. Worse still, although many forms of SI joint pain can be easily remedied with indicated care, there are a few scenarios that are difficult to treat, even using the most invasive surgical techniques. Sacroiliac joint pain can occur due to arthritis, injury or soft tissue problem, such as ligament laxity or tension. The SI joint is one of the most important in the body, since it connects the legs to the spine and provides a foundation on which our upright posture is built. Of course, the sacroiliac structure is not immune to the effects of time and activity, and so like many other joints, it often demonstrates wear and tear that might become painful in rare instances. The sacroiliac is not actually part of the spinal column, but it connects the sacrum of the spine to the ilium of the pelvis. Since the joint is a crucial component of spinal structure and function, it is often implicated when pain occurs in or around the region where the joint resides. SI joint pain is commonly confused for general lower back pain, hip pain and sciatica, so diagnosis can be a challenging proposition. This investigative dissertation provides a complete look at the SI joint and the possible pain syndromes that can originate in this vital anatomical structure. 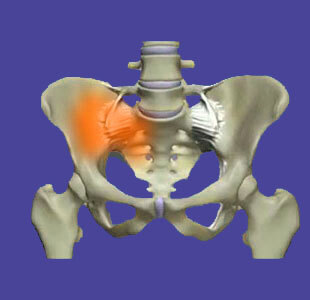 We will examine the symptoms of various sacroiliac joint diagnoses and explain the diagnoses themselves. Finally, we will discuss the various treatment paths that best serve patients for SI joint pain problems. Sacroiliitis is also known as sacroiliac joint arthritis or arthrosis. This diagnosis describes deterioration of the SI joint structure due to arthritic development on the bony surfaces that comprise the joint. Sacroiliitis comes in various forms and can be related to other conditions as well, including rheumatoid arthritis, ankylosing spondylitis and gout. Sacroiliac joint dysfunction describes ligament-related issues in and around the SI joint. Typically, the dysfunction involves ligamentous laxity that causes the joint to become unstable and painful. In other cases, the joint can become overly taut and extremely sensitive to any movement at all. Sacroiliac joint injury can occur in cases of substantial trauma, although this is rare. The SI joint is one of the strongest in the body and the surrounding tissues will usually be damaged first, including the pelvis or hip. Sacroiliac joint pain problems can take many symptomatic forms, depending on its source process and mechanism of action. Usually, the patient will demonstrate discomfort of varying degrees in the dorsal area of the hip and into the lower back region. Pain might be linked to movement or positioning, as well as long periods of inactivity. Many patients will demonstrate sciatica-types symptoms in the buttocks or legs, unilaterally or bilaterally. Some patients will experience tingling or numbness in the hip or low back, as well. Weakness of the affected leg or legs is common, as is generally reduced lower body strength and functionality. Symptoms might be worse when standing or walking and may be exacerbated by particular postures. Since SI joint pain is very similar in expression to other kinds of regional discomfort, it is often misdiagnosed. Many cases are mistaken for spinally-motivated sciatica, especially in the presence of incidental herniated discs at L4/L5 or L5/S1. Some cases of SI joint pain are also mistakenly thought to originate in the hip, particularly in the presence of osteoarthritis or bursitis of the hip joint. Most sacroiliac pain can be treated using conservative care practices. Physical therapy, injections and pharmaceutical treatment are all common approaches for SI joint pain syndromes. However, only physical therapy offers any hope to provide a cure without the substantial health risks offered by symptomatic drug therapies. Surgical fixes for SI joint pain might be a better option for patients with severe and pathological deterioration of the joint or unresolved ligamentous laxity problems leading to instability. There are many surgical approaches to care, ranging from minimally invasive to ultra-invasive. Obviously, patients who are considering surgical intervention to end SI joint pain problems should focus on finding the least invasive method of care that can achieve the surgical objective successfully. Some patients can not find relief from sacroiliac joint pain due to a misdiagnosis of some structural issue, when in reality the symptoms are created through the interactions of mind and body. These psychogenic pain conditions often target the sacroiliac joint and are often blamed on coincidental structural changes within the joint structure. When indicated treatment for seemingly-structurally-motivated SI joint pathology fails, it is always advised to consider the possibility of a mindbody pain syndrome at work. Fortunately, these conditions usually can be successfully treated permanently with the application of knowledge therapy techniques. Learn all about the full gamut of sacroiliac joint pain on our sister website Sacroiliac-Joint-Pain.Org. This site covers no other topic and provides the complete picture on all painful expressions in the SI joint.